The book is the story of why the author (DJ MacLennan), has chosen to have his brain cryogenically frozen when he dies – or as he puts it – when current medicine can do no more to save him from death. 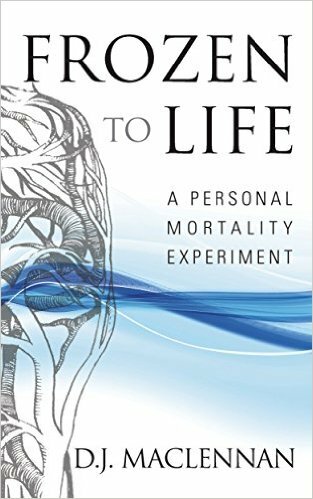 It’s a personal story, and a scientific and philosophical investigation of what it means to live and die. Here’s my review of the book. What a great opening. It certainly sets the tone of this book, which is at times quite obsessive. Yet the book is far more uplifting and optimistic than I had anticipated for a book supposedly about death. Fundamentally it’s a book about living, not about dying. It’s a statement of why we should choose life (even if cryonics offers only a slim hope of it), not death, as if we ever needed such a reminder. I was given a free copy of this book in return for an honest review. I hadn’t previously read DJ’s blog or any of his other writing, so didn’t know what to expect. I very quickly settled into the author’s narrative style and personal story, as well as the science behind cryonic preservation. He’s a great writer. A short preface inadvertently reveals the author’s status as a nerd, by mentioning his use of a Linux laptop to write the book, and also sheds light on his struggle to find a coherent voice for writing the book, and his quest to find scientific evidence to back up his claims. I think he definitely succeeded in finding a compelling voice, and as for the scientific evidence, I find myself more inclined to accept his propositions now than before. This is not a cold, logical book. Partly autobiographical, deeply introspective, it is a vibrant and personal account of why DJ wants to live on after death, not just how he means to accomplish it. His description of the experience of swimming in cold sea water for instance, evokes a tangible and visceral sense of what it feels like to be alive. I enjoyed the self-conscious and self-analytical quality of the book. I also much enjoyed the anecdotes, stories and parables, as well as the thought experiments that are inserted throughout. Interspersed between auto-biographical details are discussions of time, religious attitudes towards death and the afterlife, burial customs, theories of the mind and the self, life-extension medicine, and neuroscience. The author reflects a great deal on the nature of the self, rejecting quasi-religious notions of a soul, and explaining instead how modern thinkers see the self arising as an emergent property of the operation of the brain. I particularly liked his metaphor of consciousness being like the story in a book – a narrative built from words, but transcending the mere words and letters from which it is formed. I started out reading this book an interested skeptic, and am not wholly convinced that cryonic freezing offers a real hope of living on. Even DJ admits that it’s a last resort if all other hope has failed. There is a clue in the discussion of life-extension medicine that makes me question his motives. DJ notes that he would rather take a dietary supplement than do regular exercise, and I can’t help wondering if the cryonic freeze is just another example of an easy option. Yet, as DJ points out, even a slim chance of survival, or at least persistence, is better than the assured destruction of the self that results from cremation or burial. Cryonic preservation is the best that present-day science can offer. The author makes his case well. The book acknowledges the influence of great thinkers such as Daniel Dennett, Douglas Hofstadter and Aubrey de Grey, as well as others I was not familiar with, such as Derek Parfit, Steve Grand and Eric Harth. There are also plenty of sci-fi references, which I was easily able to pick up on, but for non-readers of the genre may prove irritating. The book is perhaps not the most accessible to the general reader. The author does at times assume familiarity with some ideas that are by no means mainstream. For example, not everyone will know what is meant by a ‘substrate’, in relation to a discussion of the mind. There is plenty in this book, not for everyone, but for people deeply interested in what it means to be human, and with a strong interest in science and technology. For such people, DJ’s voice should take its place on your bookshelf next to other contemporary writers on neuroscience, philosophy of the mind, and life-extension medicine. I will give the book five stars when I review it on Amazon and Goodreads. This entry was posted in Books & Films, Life, Science, Technology and tagged Belief, Books, Computers, Death, Health, Longevity, Philosophy, Science, Technology. Bookmark the permalink. Interesting. I’ve wondered about cryonics. I tend to think eventually someone will figure out a way to make it work, but I haven’t been able to figure out whether we’re there yet, whether it’s reliable enough to be worth the cost, whether the companies actually know what they’re doing, etc. Still, a frozen dead brain offers more hope of some kind of revival than a long ago decomposed one. It all depends on how much information is lost both prior to and during the freezing process. The other difficult question is whether the companies can stay in business, keeping everything sufficiently frozen, until the revival technology arrives. They may have to stay in business for centuries. The author of the book makes a fairly convincing case for the possibility of vitrifying the brain at a level of detail that may well preserve the relevant patterns and structures, provided that due medical procedures are followed. Of course, no one really knows just how much detail is necessary to preserve the pattern of the self. Is the connectome sufficient, or does the resolution need to be much finer? How fault-tolerant is the brain? Even if some details are lost, would the approximate reconstruction still be authentic? Can gaps be filled in? These are the kinds of questions the book addresses, to some extent. Of course there is absolutely no guarantee that the medical techniques needed to recover a person will ever exist, nor that the brain can be conserved for long enough, nor that a future civilization will be motivated to restore dead people to life. But the chance of success is non-zero. Good point about the chance of success being non-zero. But I’m not sure it’s not without risk. One fear I’d have, aside from the ones I mention above, is that I’d be resurrected in some broken fashion, missing large chunks of information, to such an extent that the revived entity wasn’t really me anymore, or even a fully functional human being. Depending on the severity, I’m not sure if I’d necessarily consider that better than oblivion. It’s a fascinating idea but I can’t help but wonder if it could be overtaken by other technologies. A virtual facsimile of your brain uploaded to the cloud or into an artificial body could be more cost effective providing we and civilization survive long enough. That’s one of the ideas the author discusses. At present, while vitrifying the brain is technologically attainable, creating a digital copy isn’t. The quantity of data is just too vast. Long term, in order to recover the self from the frozen brain, some kind of digital copying will probably be necessary. So what happens to the brain, supposing it is recovered? Is it then given a body? Is the body equally preserved? And what is a brain without a body? Does the author cover that? What happens to the brain? That is left as an exercise for future generations to solve, since the current generation has no way of restoring a preserved brain 🙂 There is some discussion in the book of how cryonically preserved livers and other organs have been restored to a working state, but more advanced medical technology would be required to restore a brain. One suggestion is that the brain could be uploaded to a computer, and this would deal with the problem of the lack of a body. Preserving an entire body is much harder than preserving the brain, and restoring it would be much more difficult too. It is argued that brain preservation is sufficiency and that an advanced technology would be able to recover a person from the brain alone. The book does have a great topic and from your description of the authors upbeat quest to discover where he resides or what makes up the inner self, I really want to read his book. The question of wheather it be the thoughts or memories that function as the lynchpin to being ourselves is a slippery rascal to grasp. It sounds like the author delves into this abyss with scientific reasoning as his guide. Thank you for putting this on the site.